and regular expression pattern searches to immediately redirect a user-entered shortcuts to target URIs (WIBISA). It is expressly mentioned, that not only pure wiki-based (using "wiki" pages, which can be changed by everyone) but also all wiki-principle based (using database tables., which can be changed by everyone) search assistants have been already disclosed in the original publication RD488004.pdf November 10, 2004, due to the following reasons. 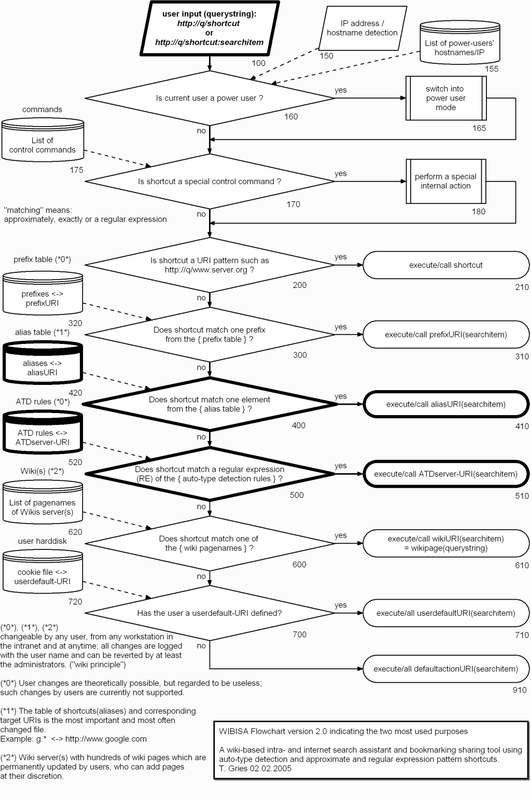 The original description already reveals this by saying in the summary and other places "The decision where to forward the users= query depends on results of queries against tables, decision trees, hashes or databases, regular expressions or against page names of one or many �wikis�, the contents of the tables, decision trees, hashes, databases, regular expressions or wikis being dynamically changeable by a user community using the "wiki-principle" wherein any user can create or change any table, decision tree, hash or database entry and pages on the wikis from anywhere and at any time, and all changes are logged to prevent vandalism. " and "search in a second table, tree, hash or database". Wiki pages such as implemented by the wiki enginie "Mediawiki" software http://www.mediawiki.org used on http://www.wikipedia.org are often realised in form of contents of MySQL database tables, which contents may be changed by any user. Other Wikis engines such as UseMod http://www.usemod.com/ realise the wiki pages in form of flat files in the directory structure of a computer, which can be changed by any user via the wiki software. 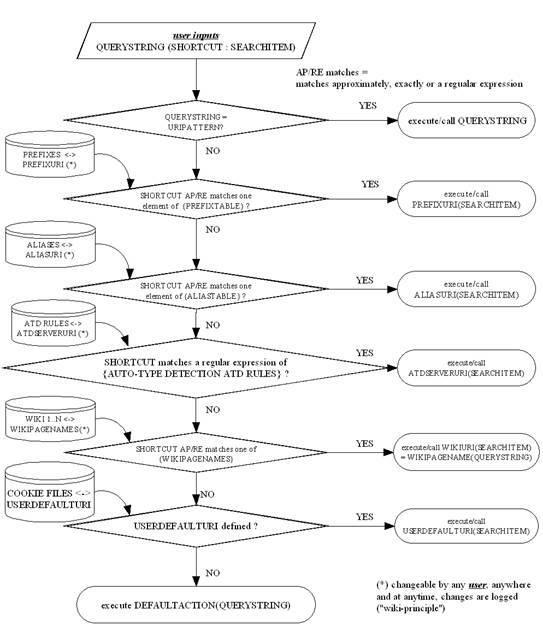 Thus, any change of the correspondences between the shortcuts (aliases) and the corresponding target URLs (aliasURL) - stored in the tables of the WIBISA disclosure http://www.wibisa.org , notwithstanding whether the correspondence "table" may be a database table, a decision tree (hard-coded in a program), a hash or even a wiki page is declared to be an application of the so-called "wiki-principle". Any method or apparatus performing the method as stated in this disclosure is unambiguously declared to be public domain and shall be deemed to be unpatentable, because it cannot be novel over this defensive disclosure or the first-filed research disclosure RD488004.pdf as of November 10, 2004. Copyright: the Author, Thomas Gries, 13. Februar 2005, 14:00 UTC. FindFind.it (formerly Serchilo) is a command-line enabling web searches, thus very suitable for command-line fans. Once installed in the browser, users can search train connections, phone numbers or documentations with a simple keyword syntax: "db berlin, hamburg", "tel meier, dresden", "php strlen". These shortcuts are organized in namespaces. Users get their own namespaces and can follow other namespaces. The code is free under the Affero GPL, the data CC-by-sa. "A (social) commandline for the web"
Server-based private bookmark tool with private bookmarks and public bookmarks, which are available for others users. A freeware Safari-Browser bookmark tool for the Mac. Example: Just type 'vt' followed by your search term(s) into the Location bar and hit return. Sogudi translates your text into a fully qualified URL and the VersionTracker search comences. Many more helpful shortcuts are included; you can modify these and easily create your own. Type 'mu' to search MacUpdate, 'dict' to search Dictionary.com, 'mov' for the Internet Movie Database, etc. If you leave off the shortcut, Sogudi will send all the words to its default shortcut instead. You can now type search terms into the address bar just like you can in the Google Search field from Apple. The difference is that Sogudi allows you to change the search engine you use. See the Default Shortcut topic of Sogudi. it requiresMac OS X 10.2.x, 10.3.x, or Tiger and Safari 1.0 or later. Server-based public bookmark-shortcut tool, wherein any user can submit a URL to receive a randomized but permanent shortcut. A tool for quick access to your favorite web services via your bookmark toolbar. It is a concept similar to Wibisa, TinyURL and DigBig in the sense, that a shortcut (identifier) is stored in a central repository (database). Printed version published in Research Disclosure vol. 488, pages 1514-1516, December 2004, ISSN 0374-4353, Kenneth Mason Publications Ltd, UK, 2004. Disclosed by Thomas Gries on November 10, 2004. A "wiki"-based Intranet- and Internet Search Assistant and bookmark sharing tool is disclosed which uses auto-type detection methods and/or approximate pattern matching and/or regular expression pattern matching and/or exact pattern matching for mixed alpha-numeric user inputs. The inputs can either be in one-part-form consisting of one word, an abbreviation (shortcut) or even a misspelling (typo) thereof for a wanted service or of two-part form consisting of a word, an abbreviation (shortcut) or a misspelling (typo) thereof for a wanted service followed by one or several search items to be sent to that wanted service. The Search Assistant uses a sequence of decisions to find a first match and transfers the users' input to the service corresponding to the first match. The decision where to forward the users= query depends on results of queries against tables, decision trees, hashes or databases, regular expressions or against page names of one or many �wikis�, the contents of the tables, decision trees, hashes, databases, regular expressions or wikis being dynamically changeable by a user community using the "wiki-principle" wherein any user can create or change any table, decision tree, hash or database entry and pages on the wikis from anywhere and at any time, and all changes are logged to prevent vandalism. The benevolent attitude of the majority of users is foreseen to draw correspondences between shortcuts and wanted services to a stable equilibrium, so that wanted services will become the most wanted services for a shortcut after a while. An administrator can clean and prune the tables by using special secret commands. the optional SEARCHITEM(S) comprised in the QUERYSTRING might be transformed, modified, or translated by the disclosed method or apparatus in order fit exactly the input format or the interface required by the said determined most suited target service, the input format might differ from the format a USER is used to. It is expressly and unambiguously disclosed, that the steps a), b), c), d), e), f), g) can also be performed in any other order, differing from the order mentioned above, which could lead to a different prioritisation between the stored shortcuts and the corresponding services. The table entries PREFIXURI and ALIASURI, which are formatted as UNIFIED RESOURCE IDENTIFIERS URI, can also recursively refer back to the disclosed method or apparatus in that a QUERYSTRING is searched in a first run and matches in one of the steps b) to g) to an entry QUERYSTRING' corresponding to a PREFIXURI or ALIASURI which in sequence executes the steps a) to f) again with that modified QUERYSTRING'. The recursion can be realised internally without the QUERYSTRING' leaving the method or apparatus in a recursive call or recursive calls. The numbers of recursions need to be counted and limited internally to a reasonable small number to avoid infinite loops. This is the only event, that the disclosed method or apparatus cannot assist the USER and needs to issue an error message to the USER. As an alternative to the error message, the processing could continue with step f). It is also disclosed to implement an optional detection of the USER computer name or another USER identifier which allows the method or apparatus to work only with a subset of all stored table entries. This advantageously realises a user-dependent search assistant in that it hides certain entries for certain users and enables or disables visibility and action of the one or other entry for them. The PREFIXTABLE is preferably an intrinsic part of the method or apparatus and contains at least partially unchangeable correspondences between PREFIXES and PREFIX�URIs to assure a basic functionality even in the case of destroyed or unavailable other tables. Optional entries in this PREFIXTABLE, which are not visible to certain USERs, can be used for remote control, debugging, administration and maintenance, such as to start a listing of all entries of all tables in the order they are processed, or to trace what table entries would match an QUERYSTRING X, or to change the visibility and action mode of certain table entries for the certain users as explained above. if no previous matches are found, a default action USERDEFAULTSERVERURI is called if it is defined, or a DEFAULTSERVERURI, which is preferably a company=s phonebook or Internet search engine, but can be any other one of the foregoing cases.